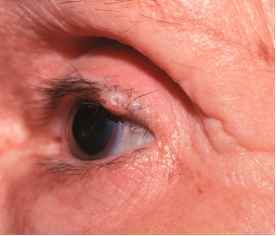 A common ocular problem of aging is herniation of the orbital fat, caused by weakening of the orbital septum. Figure 10-22 shows an example of herniated orbital fat. Note the unrelated old corneal scars and the arcus senilis, discussed later in this chapter. 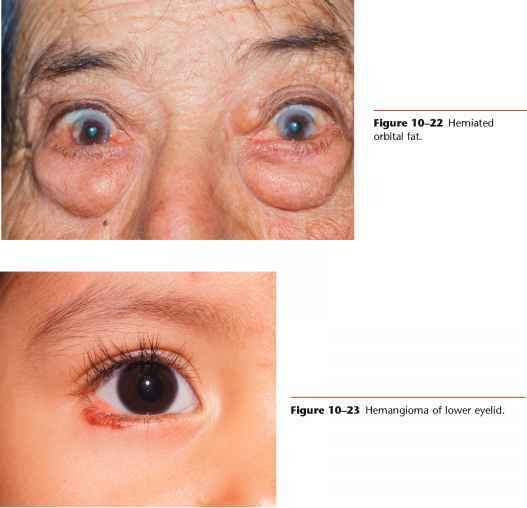 Figure 10-23 depicts a small hemangioma of the lower eyelid. Sturge-Weber syndrome is a congenital condition recognizable by a characteristic port wine stain, or nevus flammeus, on one side of the face that follows the distribution of one or more of the divisions of the trigem-inal nerve. Hemangiomas may develop on the episclera, iris, ciliary body, and choroid. Unilateral glaucoma develops frequently on the affected side if there is extensive involvement of the eye with a uveal hemangioma. 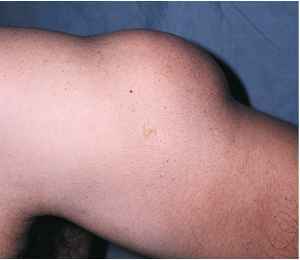 Figure 10-24 shows a patient with Sturge-Weber syndrome. Notice the sharply demarcated patch of the hemangioma with the involvement of the ophthalmic and maxillary divisions of the left trigeminal nerve. The lesion, which does not blanch on pressure, tends to darken with age from red to purple (see also Fig. 24-7). 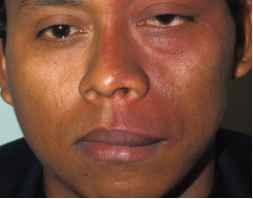 A chalazion is a granulomatous reaction to inspissated secretions of the meibomian glands in the eyelid. It appears as a localized mass on the eyelid near the orifice of the gland, usually painless when chronic. Figure 10-25 shows a chalazion;Figure 10-26 shows bilateral chalazions. 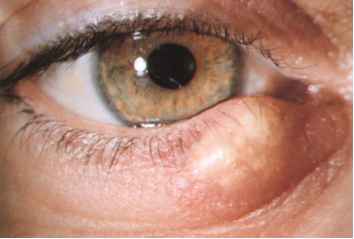 Figure 10-21 Marginal nevus of upper eyelid.